Titan is unquestionably a must have product for anyone involved in audio post production for film or TV. With the advent of a feature for bulk de-mutiplexing of poly wave files, it can shave an entire day off the turn-around of distribution of elements from the picture department to sound editors. From file prep, to EDL assembly of audio dailies and finally syncing and phasing of assembled tracks, there are other software programs that claim to be able to do these functions, however none of them match Titan's power and speed. Flash Conform - conforms multi-channel location sound recordings to picture editors EDL’s. Fix Sync - corrects synchronization discrepancies between location sound and audio from the picture editors. Flash Cutter - re-cuts Pro Tools sessions to follow changes in picture edits. 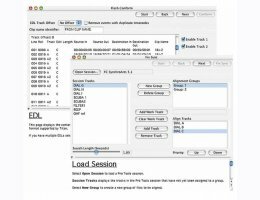 Creates Pro Tool 9 sessions. Better handling of badly formatted audio files, will create file error report. Creates a simplified text report file that can be used in other applications. Warning if Source and Destination frame rates do not match the EDL. Can read Light Works EDL’s. Compatible with Pro Tools 9. Improved alignment in fast mode. Can now operate on sessions which contain AUX, MIDI, and other non audio tracks. Mac OSX 10.5 or higher and an Intel processor.